The Nintendo Switch is finally here and available worldwide! Announced just a few months ago (in October), the Switch is the newest gaming system from Nintendo. It includes detachable, wireless controllers that hook onto the actual gamepad itself, which allows for on-the-go accessibility that has only been provided once before (with the DS series). 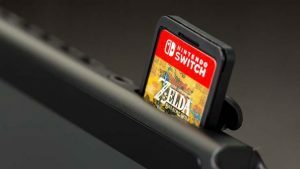 The Switch is essentially the hybrid of at-home gaming and carry-on gaming, and is dominating other competitors such as the Playstation 4 and Xbox consoles. The device itself carries 32GB of storage, and supports additional storage, via SD cards, up to 2TB. It also has its own speakers, charging dock, headphone jack – the works. The screen is brighter than its last carry on predecessor, The 3DS, by nearly nine times the pixels. Comparatively, the 3DS’ screen is 400 x 240, and the Switch’s screen is 1,280 x 720. This is coupled with the most advanced touchscreen capability to date for Nintendo, equipped with a 720p touchscreen capacity. The battery life for the system itself lasts for about 3 to 6 hours, which isn’t exactly impressive compared to other handheld gaming devices. However, since the Switch is charged via USB cable, this is easily fixed with an external battery pack. The Joy-Con controllers, however, must charge while the Switch is being charged, but are rated to last up to 20 hours. The Joy-Con controllers themselves are bright red and blue, and act similarly to the Wii controllers from previous consoles. However, the difference between the two, besides the obvious paint job, is the shape of the controllers themselves. Instead of the original white, sleek, rectangular controllers, the Joy-Con controllers are curved to fit the Switch, providing a more compact shape for on-the-go gaming. The safety straps, however, did carry over, for obvious reasons. Click image to view source. Copyright @ PCMag. However, the game dominating the charts is their showrunner, “The Legend of Zelda: Breath of The Wild.” Rated by IGN and multiple platforms across the web as 10/10, the game lives up to the legacy of the “Zelda” series. From impressive graphics showing off the world of Hyrule, to little secrets and puzzles along the way, the game provides hours of endless content. Reviews are raving about the freedom of the game too, as side paths allow gamers to veer off into the virtual world at their own pace for as long as they desire. To wrap things up about Nintendo’s new breadwinner, though, I’ll address the elephant in the room. Or rather, the cartridge in the system. Ever since the Switch was released, many online personalities have tested the theory that the Switch cartridges are considerably disgusting to consume. Obviously, you should not consume anything inedible, like a game cartridge. Denatonium Benzoate, for all you non-chemical savvy readers out there (me included – I had to do my research), is the chemical considered to be the most bitterest substance known to science. The chemical was accidentally created back in 1958 when scientists were experimenting and trying to create new anesthetics for dentists. So, be glad you don’t have to worry about having that stuck in your teeth the next time you’re at the dentist. Now, the substance can be found in rubbing alcohol, anti-freeze, liquid soaps and shampoos. If your curiosity gets the better of you, just know that the chemical itself is not a toxic substance. It just tastes really, really bad (so don’t do it, please).